Healing properties without the stinger. Australians learned from the aborigines the many valuable healing qualities of emu oil. Further studies revealed that emu oil’s high content of oleic acid gives it the ability to penetrate the skin and carry with it many different medications. Emu oil is an anti-inflammatory (reduces joint swelling and pain), a good emulsifier (blends well with water), bacteriostatic (grows no bacterial organisms), and non-comedogenic (does not clog skin pores). Studies have shown emu oil to be effective in treating burns, bursitis, carpal tunnel, eczema, muscle pain, and psoriasis. Each bottle contains 10 cc of emu oil with 11 milligrams of dried bee venom (1000 stings). The oil is simply rubbed into the skin carrying the bee venom with it. If the skin feels oily then too much is being used in one area. • Roll between your hands or run under hot water before use aids in absorption. DO NO PUT IN MICROWAVE. • Shake the bottle before each use. 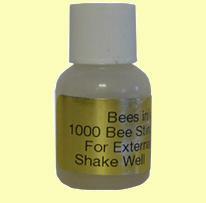 Bees-in-a-Bottle is at its highest concentration and needs to be shaken often. Emu oil has no odor and will not stain your clothes. Wash hands with warm soapy water after application. Pat Wagner, also known as “The Bee Lady” was gracious enough to write a letter to our customers explaining the usage and uses of Bees-in-a-Bottle. Feel free to download her letter, which is in PDF format, by clicking here. Harvesting bee venom is a costly, extremely labor intensive process. Price per bottle: $23.00 plus shipping. Shipping is $12.00 per order UPS Ground. To order using your credit card or PayPal just click the ebay button below! SAVE 15% by sending us a check or money order. With your payment please include your Name & UPS address. Bees-in-a-Bottle contains real Bee Venom. Bee Venom can cause allergic reactions. Users of Bees-in-a-Bottle do so at their own risk. Ferris Apiaries will not assume responsibility for any and all adverse reactions. Consult a licensed physician before ordering and/or using this product.